Tommie Copper is a series of compression sleeves line that claims it can help with joint and muscle pain relief. The product is endorsed by Montel Williams. Compression sleeves have been used for a while by professional athletes to speed recovery and relief joint pain however the biggest problem is they only can be used for short period of time as they are very uncomfortable to wear. Tommie Copper uses the combination of 2 technologies copper and compression to create a line of compression sleeves that claims to be comfortable enough to wear all day to help relief pain and swelling. 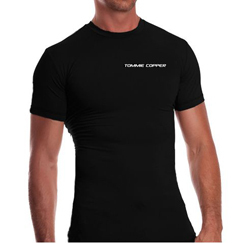 Tommie Copper comes in a variety of designs including a ankle sleeve, calf sleeve, elbow sleeve, knee sleeve, women shirt, men shirt, fingerless gloves and full finger gloves. With your help we can reach more people and let them know about Tommie Copper whether this product works or not. I regret I was naive enough to fall for this company's advertisement, in my opinion and experience, it is a terrible product , it doesn't work, doesn't support sufficiently, doesn't relieve pain, doesn't help the condition in any way, and it is a huge waste of money. The customer service is terrible as well. Do not know if it works yet, I just received it yesterday and the letters on the sleeve are falling off already. The thing that irked me was charging $4.95 shipping and handling when all they did was stick it in a letter envelope and hand it to the postman. They shipped to me less that 15 miles away. The sleeve doesn't weigh more than 2 ounces. How can these reviews be so different? Are some people looking for the 100% cure with a 40$ purchase? Went by their measurments and when I put the shirt on,it did not even fit over my chest.Very dissapointed. And when I called customer service,they could care less. There shirts are made in Guatamala and I thought it was a poorley made shirt. my story starts from an injured hip that would keep me up at night with pain. Any way I would turn in the bed hurt. I decided, after reading reviews, on the compression shorts from Tommie Copper. Let me tell you, this stuff works! The first night I slept in my Tommie Copper, no pain! Now I wear it constantly and still no pain. It IS worth every penny. Bottom line...... It works! I purchased the fingerless gloves. 1st off the gloves are not a finished product. They simply took their full finger regular gloves and cut the fingers off. Since I have a desk job I decided to wear them anyhow. To my dismay, the left glove started to come apart at the wrist cuff area where the body of the glove is attached to the wrist band, in several spots. The right glove started to unravel down the seam of the glove toward the palm. this may not have happened if the finges were finished with a hem rather than just cut off and left to fray. I saw the infomercial with Montel Williams and did a little research. My husband has had knee pain for a long time and post surgical it seemed to get worse. I ordered this product and he said the results weere simply amazing! In 20 minutes TC did what surgery and pain pills have been trying to do for years. he was amazed. As was i but i thought the real test would be my Sister who has been struggling with knee pain from a car accident in the 90's. Her pain is continual and hard to live with...I bought her TC knee sleev and she called me beyond words. She said it is simply AMAZING! NO PAIN FOR THE FIRST TIME IN HER LIFE-NO PAIN! That is amazing. TC works thats all i can say. THANK YOU FOR THIS PRODUCT IT IS CHANGING PEOPLES LIVES. My Sister went for a walk around the mall yesterday-FIRST TIME IN YEARS! Update on my 8-17-13 posting. My EMG came back "Toxic Metabolic". I am having the sores which have not healed since February biopsied tomorrow. I ordered tc clothing to help my knee pain, instead I have ended up with full body severe pain, sores, edema, now showing a toxicity to copper metabolism disturbance. Since the clothing is made in slave labor countries according to the tags in my items, we don't know what is in the copper/lead mixture, nor in the latex and cloth for the clothing. I am spending more time in Drs offices and insurance does not cover any form of heavy metals detoxing programs, for copper, lead, etc. I continue my fight with the owner of Tommie Copper, Tom Kallish. The sores, edema, itching, buring, that I have suffered does not end. I sent the pictures of my reaction to Tom Kallish and he basically told me to get lost and contact his attorney. I've contacted Doctors, Nurses, Nursing Instructors, Vasculitis Foundation and they all say the same thing. The sores and reaction I had to Tommie Copper Clothing is a "Text Book Case" and none of them have ever seen anything like it. The sores are still not healing since they developed in February 2013 and it is now August. No one knows how to treat them because no one has ever seen anything like it. They itch, burn and ooze a yellowish liquid. They are affecting the feelings in my legs and feet and the Doctors have ordered an EMG as I have so much trouble walking and a numb sensation in my feet and lower legs. My pain is so much more SEVERE since I wore Tommie Copper clothing and can NOT get any relief, plus the sores that will not heal. Whatever is put in the copper and material used in the Tommie Copper Clothing caused this severe reaction and the sores look like a parasite rash and since the clothes are made in slave labor countries, it is very possible that the clothing is infested with parasites which appears to have happened to me, PLUS the itching, burning, edema, sores AND my skin also turned green from the copper absorbing into my skin and blood. Tom Kallish states this can happen on his website that you can have an allergic reaction and that the copper will absorb into your body. After seeing my pictures, the lab results of a much higher copper level in my blood and my story, I was told to "get lost." Tommie Copper's owner is interested in ONE thing ONLY, how much money he can make quickly. He is NOT interested in your health as proven how he has treated me, only in the money he can make. Wonderful product. Gives warmth to bad knees and the compression keeps the knee from turning and twisting. Have had them a year and they are still like new. Very well constructed. They do not slip down due to gel under the band. Bought the gloves about a week ago and I too have them tearing at the seams? Apparently they need to inprove the design. As far as relief, I really haven't seen much if any. The gloves are hard to get your fingers thru but I have a problem with my hand, so that is okay. I also bought the under wear ? Glad I only got one pair! Paid for 2 knee sleeves April 20th and now May 7th no product.. Call email customer service and refer me back to UPS and tracking number. Call UPS again and they say post office fault. Call post office they say UPS shows delivered. If the product was delivered I would not be calling. Now to wait and see if PO can find or recall ever seeing the package.. Still no package found out that company ships UPS and they in turn drop package at local post office. Post office will deliver in 2 days. What a poor way of doing business. In case you're wondering I bought and paid with PayPal for 2 knee sleeves on April 20th. So disappointed with company and shipping product. I paid via PayPal on April 20th for 2 knee sleeves and it is now May 1st and no product. I have never had issues with having to wait so long for ground shipment, I have had product come from the UK & china quicker than this. Made my pain worse especially driving. I returned my knee compression . Hope this company refunds me as promised . I had 8 more days before my refund expires. Don't bother!! The worst purchase I've ever made. Definitely a rip off! Montel should be ashamed of himself. What a liar. One thing I've learned..... if Montel is representing a product ....RUN. again.... a piece of crap. And even worst "customer service". I ordered two of these almost two weeks ago, received payment confirmation then heard nothing else. I wrote and got an e-mail saying "Sorry to hear you're having problems place your order. It appears your payment did not go through." I called customer service, got a machine, was told to leave a message. Called the sales line and got a person and he said the same thing. I gave him the PayPal transaction # and about 15 min. later..."Oh, I guess we did get it. The problem was on our end." He mumbled so bad I had to say "I didn't get a word of that" several times". He mumbled that they'd go ahead and send it out and I said, "I would appreciate overnight service as I am injured and needed this a week ago, could have gotten one on eBay and had it by now. They said they would, but couldn't send it out until tomorrow. We'll see. This is a company heavily invested in sales, not service, and now I'm regretting buying two as it sounds like returns are just as hard. Just remember, folks. Paypal protects you. You can file a claim for "item not as represented". This was my first infomercial purchase and probably my last. I cut the end off a tube sock today out of desperation and I'm thinking that might work just as well as anything else, feels great, so if you're in a pinch, give that a try. +1 on the "Anything Montel would hawk..." Lesson learned. I continue to head in the opposite direction of pain since April 2012 when I started wearing Tommie Copper compression wear! I am not exaggerating when I say that over the last 15 plus years I have spent THOUSANDS of dollars for diagnostic and muscle testing, chiropractic and massage therapy etc. Nothing prior to Tommie Copper had given me lasting relief! Thank you Tommie Copper! Poor product and even POORER customer service. Dont waste your time and money. I returned product ..waiting on my refund. TICK TOCK TICK TOCK! I have purchased several tommie copper products and have found all to be wonderful. I wear the long and short sleeve shirts, the short finger gloves, knee sleeves and the crew length socks. All have made may rheumatoid arthritis feel better. Not 100%, but at least 50% + better than before I wear each product. I am very satisfied and have recommended them to my friends. I even purchased the knee sleeve for my wife! Did I get 100 per cent relief? No, but I obtained enough relief to allow me to walk comfortably. Would I buy or am I interested in other Tommie Copper products? Most certainly and I have recommeded it to other friends with knee problems. I have other compression shirts that are much better as far as being much more supportive and hold me tight but to my pleasant suprise this shirt keeps me so warm and it increases my circulation. I suffer from cold hands and feet. My hands are never cold the days I wear this shirt. I bought one long sleeve and one short sleeve. I wore the short sleeve to yoga and the continued warmth is wonderful! My husband asked me why my hands are so warm!!! I would reccomend this for people who have trouble keeping warm. I start to itch after 8 hours and take it off. Should of known anything that scum bag Montel is selling is junk! There is not enough compression and the sleeves just keep rolling up. Its so annoying and no relief at all. Tried to return them but company does not respond to emails. I guess i should of contacted that phoney Silvia Brown first before sending my money. Montel can shove his blender. his physic Silvia and his copper tommies up his you know what! Got my fingerless gloves a week ago and have been wearing them 24/7. Am I totally pain free? No but can I tell a difference. Yes. Being a seamstress my major problem is with the quality of the construction. It is shoddy at best. I have already repaired two seams. THe fingers that show covering the middle knuckle bearly reach my knuckle and I have small hands. The top of the fingers is nicely hemed under but the bottom of the fingers is simply cut off and left with a raw edge. And the rubber grip strips on the palms have already come off. Imagine my surprise when I looked on the tag and discovered that they are made in the USA. I expected to find them made in Haiti of China. Will I recommeds them to friends yes but will also tell them about the construction quality. At first I thought procduct was flimsy and cheap. Then after a severe arthritus attack with cramps in my lower back, shoulders, and abdomin, a voice in my head asks me if I have any rings or bracelets for it. I'm thinking thats right Mrs. G used to wear copper chain around her wrist and so did my friend Jim. I opened the drawer and put on my Tommy Copper shirt and pants. Went to sleep and when I woke up I felt much much better. The warming effect of the product provided much relief equal to an hour lying in the sun. I was up running around, off my crutches, and even felt like doing some push-ups. I'm wearing mine 24/7/365. Purchased 2 of them - They are worthless - Wore them one day and at the end of the day they rolled down like old socks - no compression what so ever. I should have known to never trust any crap endorsed by that lying Montel Williams. Do not bother sending the product back - you will not get a refund. This product is useless. They roll continually. More annoying than anything. Don't waste your hard earned money people. Bought knee compression sleeve on Dec 1st., 2011 and after one week no change in knee pain. Sent it back for refund based on 30 day guarantee and contacted them by email twice. It has been over two weeks now since USPS Priority Mail delivered it back to them and they do not respond to my emails and no refund given. THEY DO NOT BACK THEIR GUARANTEE. Not a good company as far as I'm concerned. I use the knee sleeves for arthritis like pains that I get and they work like a charm!